﻿ Best Price on Alizes Bungalows in Sainte Anne + Reviews! Alizes Bungalows is located in Sainte-Anne. Free WiFi access and free private parking are available here. The bungalows here will provide you with a TV and air conditioning.There is a full a kitchenette with a microwave and an oven. 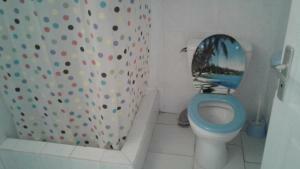 Each private bathroom comes with a bath or shower and a bidet. You can enjoy garden view from the room. At Alizes Bungalows you will find a garden and barbecue facilities. Alizes Bungalows is located within a 15-minute drive of Match Pliane Supermarket and a 25-minute drive of Pointe-à-Pitre International Airport. Air conditioning is included at night, and it is optional during the day (Additional fee applies). The 24/24 option can be activated according to your request, for your total stay, or punctually. The WiFi is accessible in the bungalows in CPL/ADSL connection. Bedding available in orthopedic comfort range, and also in superior range. Please inform Alizes Bungalows of your expected arrival time in advance. You can use the Special Requests box when booking, or contact the property directly using the contact details in your confirmation. A security deposit of EUR 400 is required upon arrival for incidental charges. This deposit is fully refundable upon check-out and subject to a damage inspection of the accommodation.